There are quite a few commenting system that can be used with Blogger platforms. Apart from the standard commenting system installed with Blogger templates, blog owners can easy integrate 3rd party comment systems which has plenty of features including integration with your social networks. The day Blog Irsah was developed, we have used Intense Debate as our comment platform, be it for our daily "rants" at our blog to our design support website powered by concrete5, a free and powerful Content Management System to build just as any, from web portals to blogs, micro-blogs to e-commerce websites. Installation is also a breeze with various tutorials from Intense Debate Support Team and also bloggers like you. Why We Choose Intense Debate? 1. Depending on your blog-ing environment, users who visits your blog could comment easily using Intense Debate. Just by including a name and a valid e-mail address, it is easy letting visitors to comment on your published articles without any log-in - many users prefer this. It also displays users avatar (profile images) if one activates it. 2. If you think that your visitors prefer connecting their social networks profiles, you can also activate Intense Debate Social Log-in system easily and automatically your users can comment by using their social network profiles. 3. Web visitors can also leave their current published post links too, if you activate the CommentLuv feature built with Intense Debate. It is a great tool to bring more visits to your blog and encourage more traffic change. 4. Unlike other 3rd party plug-ins, just like Wordpress, you can easily customize your Intense Debate layout design with simple CSS to your liking. An example customized comment layout can be viewed at our blog down below. 5. Intense Debate also has automated notification system sent to your registered e-mail. Just like Blogger standard comment system, you can easily delete, approve, deny, flag SPAM comments, just by replying to Intense Debate notification e-mails. You can also reply your blog visitors comments via your Intense Debate notification e-mail(s), without visiting your blog to view it! 6. You can also manage your visitors comments and even filter out words to your liking. Activate AKISMET spam filtering built with Intense Debate, and unnecessary words (or SPAM words we called it) will automatically deny comment approval. It is a good way to push away spammers and create healthy, quality, family oriented links coming from your blog. 8. You can also import or export you comments from other blogs, so that it can be available on your new created blog with simple uploads and tutorials provided by the support team. 9. In Blogger platforms, you can also activate your Intense Debate comment system and leaving your old published comments powered by Blogger. 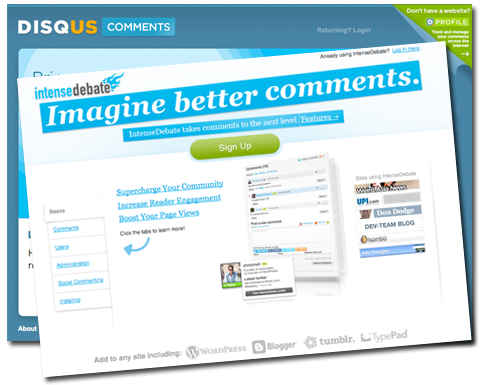 You can select a few options on integrating Intense Debate from the start of your published pages or just include Intense Debate comment system for your newer posts. 10. The bottom line - It;'s FREE, workable and easy to use comment management system with loads of customization features. Here, we're not saying that it is the best comment system, as other 3rd party comment system has it's positive and negative side. It depends on what these 3rd party comment system developers is aiming for, which you as blog owners, now have a variety of selection to work with. It is best for you to study a bit on your visitors background and what would be best (and easy) for them to comment on your blog. You might also want to look at these comment management system, which you feel more comfortable to work / adapt with. Well for us, using Intense Debate just leave spammers at bay. Unlike our other blog(s), using the standard Blogger comment is just like "inviting the bees to the honey". There's several time we had to manage our comments all day, to filter out unwanted comments left by these spammers / trolls. Luckily our blog and websites are using Intense Debate to cater our user's comment needs and also it worked best with our workflow. The best part, we can re-design Intense Debate looks so that it displays more professionally built, especially for your business related / niche websites or blogs.